Nivea Creme has been softening the faces of women since it was first produced in 1911, and now it has one more loyal fan – me! I have read so many reviews of this affordable product, many of them comparing it to the super expensive Creme De La Mer cream as they have very similar ingredients. At only a couple of pounds a pot I was happy to give this one try. It’s not very often while leafing through vintage magazines that you spot a product that you can still pop to the shops and buy, this is one of the few products hat has really stood the test of time. When it was first produced it was targeted at women, however people soon found a number of uses for it, including as a shaving product and a baby cream. Modern day Nivea experts also recommend it for removing make up and for smoothing your hair, so it’s a great all round product. The packaging is very simple, it’s just a plastic pot with the name printed on it, so it definitely doesn’t look like a luxury product. It is one of those products that will go in a drawer rather than sit with pride of place on my dressing table. 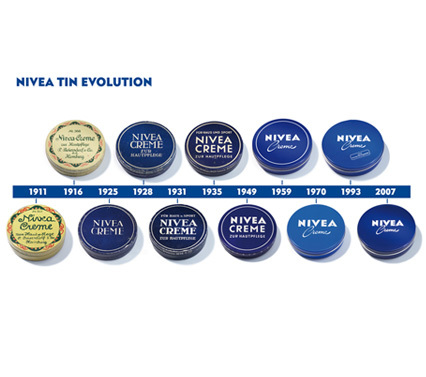 I think it would be amazing if Nivea bought out a vintage addition replicating some of the older packaging. The cream itself is surprisingly thick and solid, not like most moisturisers at all, and from that point of view I would mostly recommend this as a night time cream or one that you smother your skin in when your not going anywhere. In my opinion it’s a bit heavy for under make up. I have pretty normal skin, so for someone with slighty dryer skin it may absorb more quickly. When ever you do decide to put it on, it is absolutely fantastic for softening the skin and replacing any lost moisture. It also smells lovely without being heavily perfumed. I mostly use it at night after a really good cleanse and tone, I also use it daily on my hands especially in the colder months. I have also used it on Lila who gets quite dry skin and extremely mild eczema, and it really soothes and moisturises her skin, more than any baby specific products I’ve tried. Nivea Creme is widely available and can be bought in most pharmacies, and supermarkets. The magazine advert featured in my pictures is from a 1949 issue of Heiress magazine. I love that you used a vintage advert of the cream as a backdrop for some of your pictures! I tend to find Nivea a little greasy on my face but think it makes a lovely hand cream… I honestly had no idea people use it purposes other than moisturising. A nice review. One of the things that I love about this endlessly classic cream is that, unlike most scented beauty products of any kind, Nivea cream has never irritated my super sensitive skin, and as such I almost always have a pot on hand and use it frequently. Hello, I’ve just found your blog. I use Nivea to remove my make up (as per Granny’s advice when I was a teenager!) I find it a bit heavy for a moisturiser but it would be good on drier skin. I have been using nivea since the age of nine. My mum used it and always gave me the little tin with a little in it for myself. I still use it today every day… I am now 67 !I still feel as though my skin is drinking it as soon as I apply it!!! !